Penthouse in Marina. Views to the sea Almeria Andalusia. 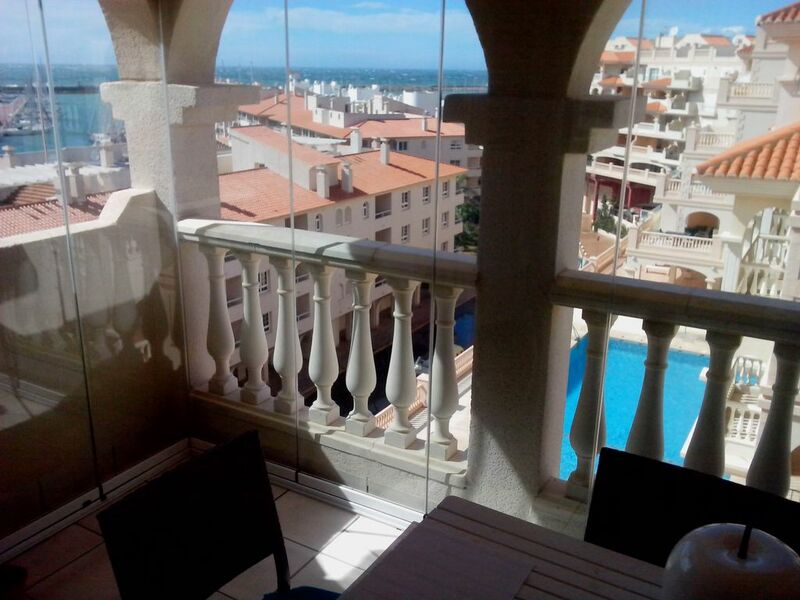 Studio with good sea views with private terrace on upper floor. Studio for 2 people in bed, private roof terrace for sunbathing + chill-out area. Penthouse excellent views of the sea and the marina. Bathroom Kitchen Washing machine and iron. Bed 150 cm away from the living room and armchair-bed Chaise longue of 140 cm in the living room. Air conditioner. Located next to public parking and large supermarket. 5 minutes from Bars, restaurants and Pub's in Puerto Deportivo. 10 minutes from two quiet beaches, one of them Natural Park. Golf course 2 minutes. Promenade Everything walking, without taking a vehicle. Alhambra in Granada at 1h and 15 minutes by car. Natural Park Cabo de Gata at 1 hour, and Almeria Airport at 40 km by highway. Visit to the filming locations of the Western movies with live show in 1 hour by car. Too much sun light and air. Warn weather nearly all year. All services around walking. Laundry Restaurants and pubs. Situated in the Marina port. 2 minutes Golf course and big food supermarket. 10 minutes beaches. Here are Mexican, Chinese, Italian and Spanish restaurants (fresh fish and meet) offcourse, walking in a few minutes around the marina. 1 hour by car Granada and Alhambra. Almería Airport 40 minutes by highway, and Malaga airport on 90 minutes. You can visit famous locations fron the western films with public function at Tabernas desert about 1 hour by car. 1 comfortable bed and 1 Chaise longe bed too. No rooms, its a loft. Full equiped cooking. Complete bathroom Automatic clothes washer. Prívate Sun roof with chill-out zone. Non private swiming pool but quiet at first floor. See photographs. You will see the sea fron the diningroom. We are a family who has got our little property near de sea. Nice apt. Clean and comfortable. Nice host. Good communication.would recommend. Totalmente recomendable. Rafael, el propietario, es muy atento, amable y siempre lo tienes cuando lo necesitas. El apartamento es tal cual lo ves en las fotos. La localización perfecta. Te dientes como en casa. Gemütliches, ruhiges Appartement mit Blick auf die Marina. Der Balkon ist verglast, so dass er auch bei kühlerem Wetter und Wind zum Essen benutzen kann. Das ist auch notwendig, da innerhalb dafür kein Platz vorgesehen ist. Eine Treppe höher befinden sich eine Ablage für die Kleider und der Zugang zur Dach-Terasse. Supermarkt gleich um die Ecke. Gracias Hans por tu sinceridad. Para nosotros es importante que nuestros invitados sepan exactamente lo que ofrecemos. Hacemos lo posible para que nuestros huéspedes disfruten su estancia y siempre es una satisfacción leer comentarios tan positivos. Así que, muchas gracias a Juan Manuel y familia. Todo perfecto! Apartamento muy completo. El apartamento cuenta con todo lo necesario, no le falta detalle. Muy bien situado, cerca de tiendas, supermercado, bares, restaurantes, pubs...tienes de todo a pocos metros. El trato ha sido genial tanto por parte de Rafael como por la chica que nos recibió y despidió, muy amables, si necesitas cualquier cosa están disponibles todo el tiempo. El apartamento está muy bien situado, todo muy limpio y no faltaba ningún detalle. En perfectas condiciones. Todo a pie. Supermercado a la puerta y fácil para aparcar. Muy bien atendidos por Rafael. Un 10! There are plenty of bars, restaurants, ice cream parlors, pastry shops, boutiques, surrounding the docks of the marina. There is a medium-large supermarket 2 minutes walk away with a public parking. There is a large golf course in front of the building that has a public parking. There is also a sailing school. In season there is a boat that gives tours to see whales, or snorkel. Obra de reciente ocupación. Mobiliario recien comprado.